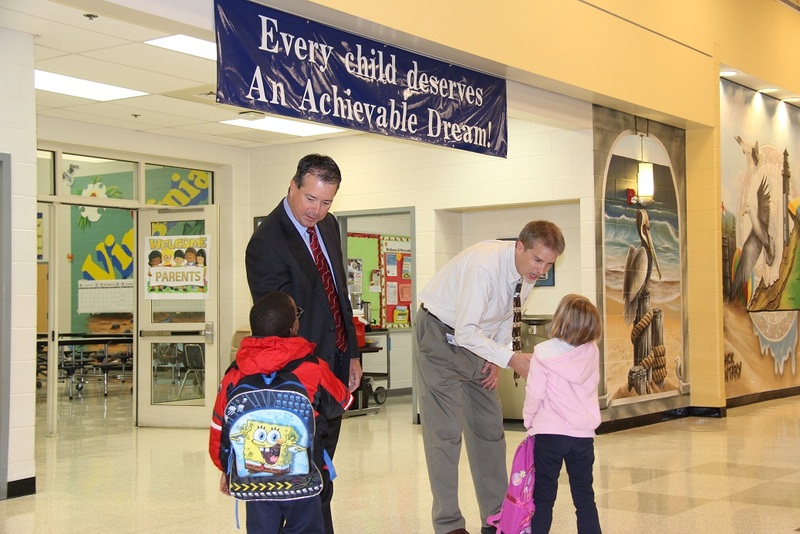 Virginia Beach Education Foundation (VBEF) board members had a firsthand look at how the foundation’s schoolwide grants are supporting teaching and learning. After helping greet An Achievable Dream Academy students with handshakes as they arrived at school, VBEF board members received a tour of Seatack Elementary School’s community garden. 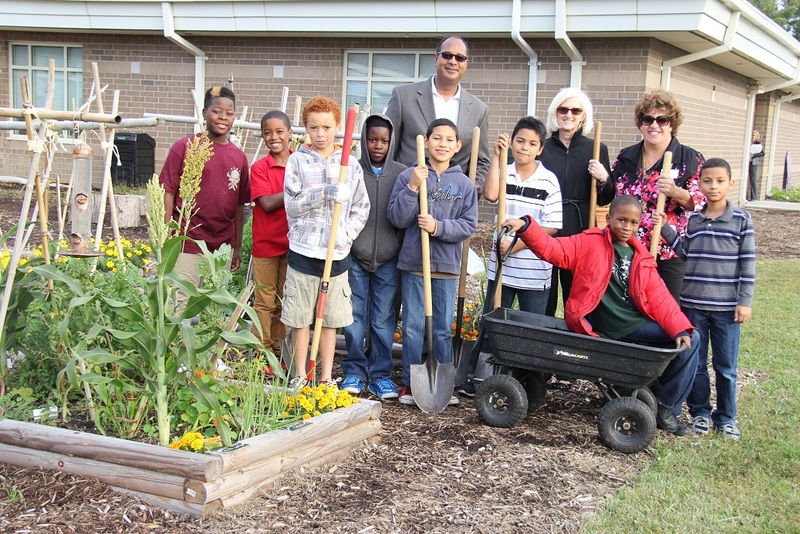 The school’s garden was made possible when the grant submission “It Takes A Community To Grow A Garden,” won a 2014 VBEF Schoolwide Grant in the amount of $5,000. To continue the students’ work this year, project director and Seatack gifted resource teacher Marie Culver received $1,000 from the Future Leadership Partners of the Hampton Roads Community Foundation. 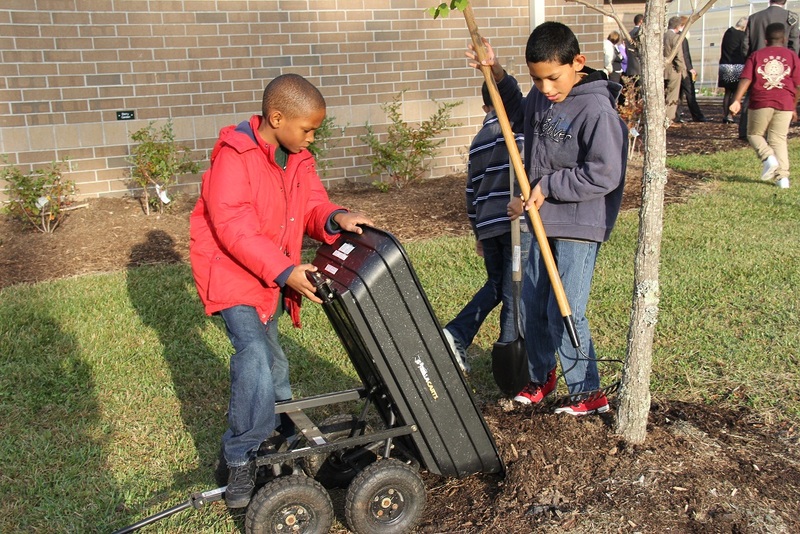 Seatack Elementary’s “Breakfast Club” members work in their school garden. Culver introduced VBEF board members to the members of the fifth-grade garden breakfast club who were hard at work spreading mulch around trees on site before they went to class. The students gather every morning to eat breakfast together, sitting on tree-stump chairs in the garden. Then they go about their business in the garden, caring for vegetable plants and flowers and monitoring plant growth. Culver shared with VBEF board members that the breakfast club members’ teachers have observed growth in students’ classroom performance as the students are supporting the growth of the garden. Attorney Lamont Maddox (Future Leadership Partners member), Debbi Steiger (Hampton Roads Community Foundation Vice President for Regional Outreach) and Marie Culver with members of the fifth-grade garden breakfast club. Seatack’s garden has also benefited from Partners in Education. Recently, the Hopper Information Service Center helped provide Seatack additional resources for the garden. 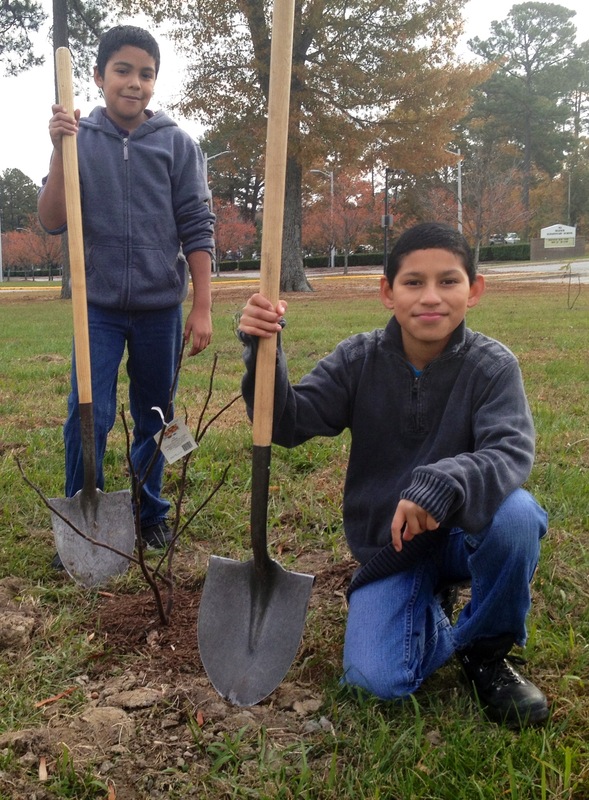 Garden Breakfast Club members, Kevin Perez and Gerardo Ramirez- Quinoes, planted six fig trees for each grade level K-5 with the help of Seatack Elementary’s new Partner in Education (PIE) HOPPER Information Service Center, USN. Way to go Ms. Culver! We love you! Keep it up!